Travel with us to the Great Barrier Reef and become a Marine Conservation Volunteer. No Limit Adventures has teamed up with a dive operator in Cairns, with a high commitment to environmental sustainability, to offer a unique marine conservation volunteering opportunity. 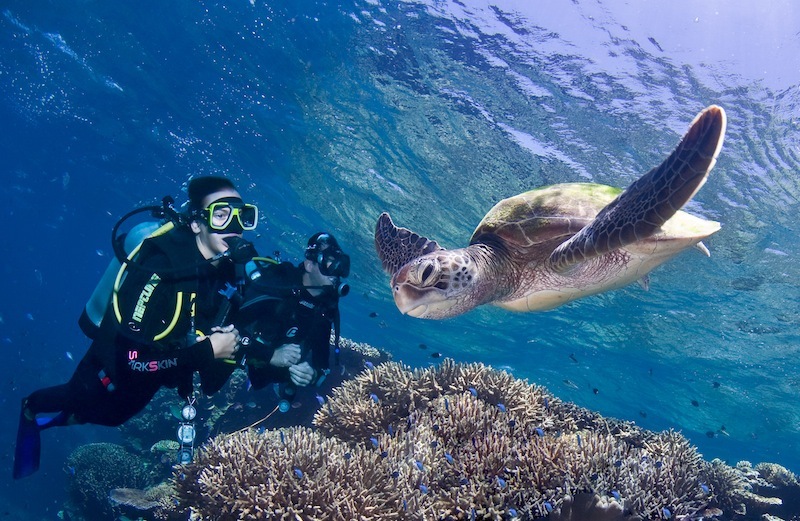 Spend your volunteer holiday in Cairns and enjoy our 12-day program that combines the adventure of diving with marine conservation on the Great Barrier Reef. 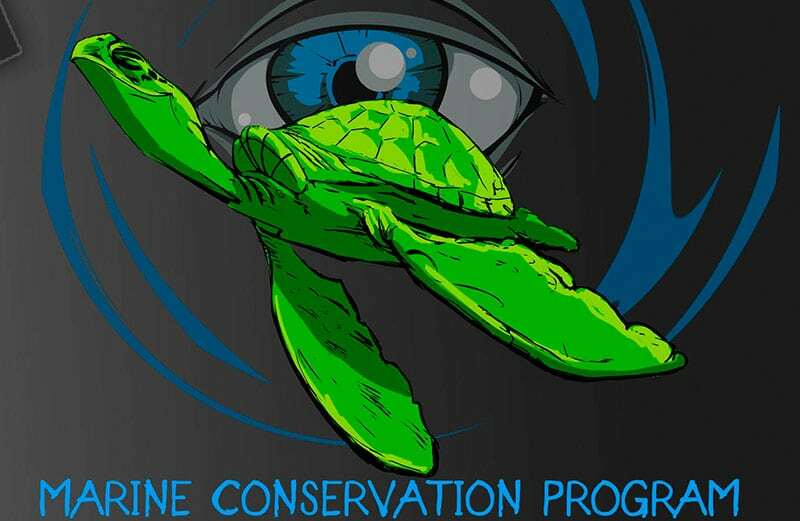 This unique dive and marine conservation program, comes under the Great Barrier Reef Marine Park Authority’s (GBRMPA) powerful monitoring program called Eye on the Reef. It is designed for people interested in scuba diving, volunteering, environmental sustainability and marine conservation. Learn to dive and become a certified diver on the Great Barrier Reef. Once you are certified and as a marine conservation volunteer, complete a number of underwater Rapid Monitoring surveys with your dedicated Eco-guide. Your task will be to collect valuable information on reef health, marine animals and incidents on the Great Barrier Reef. As a result information you collect will help the Great Barrier Reef Marine Park Authority (GBRMPA) build their knowledge of the health and resilience, and the risks to that resilience, on the Great Barrier Reef. 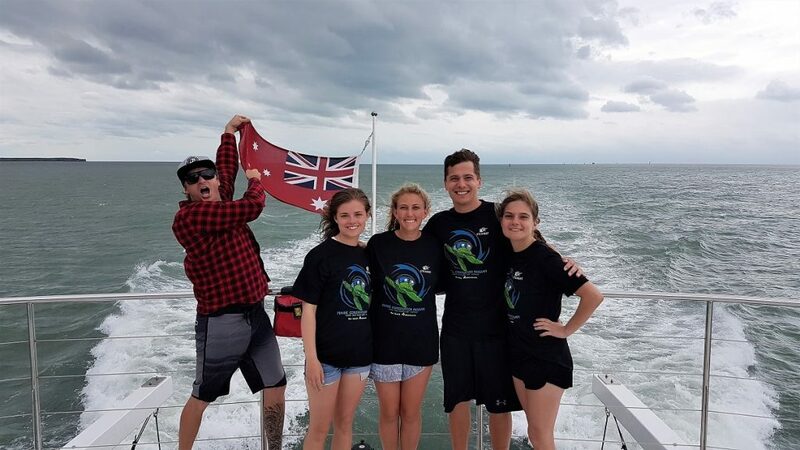 We will be working together to ensure each marine conservation volunteer walks away with a great deal of self-fulfillment from participating in our unique marine conservation program on the Great Barrier Reef. Your involvement will contribute to the reef’s long-term protection. Prices are based on a group of min. 4 persons. Speechless. Can’t thank Konrad and Russel enough for making my experience everything and more than I expected. I can't recommend No Limit enough. I was a solo traveller and these guys made me feel a part of a family when I was in cairns. I honestly had the most amazing time! The people I met through this program I’ll treasure forever. The program itself was amazing, I learnt so much and will definitely be back. If you are looking at helping out the Great Barrier Reef don't hesitate to go through No Limit Adventures. Arrive to tropical Cairns and transfer to you hostel. Enjoy your day discovering Cairns by foot. Points of interest include a stroll along the Esplanade, the Botanic Gardens, a swim in the Lagoon, the port and the CBD. Group briefing late afternoon/ early evening at a time TBA. In the evening you will attend the Reef Teach presentation (18.30), an insight into the magical world of the coral reef and a great theoretical introduction to the underwater world for your upcoming diving adventure. Note: Participants should arrive at the hostel by 16.00 in time for the briefing. Briefing time to be confirmed by your local host. Note: days 2 – 3 Open Water students only. Free time for all other participants. Rescue Divers: your course commences on day 3 at the training centre with theory. Travel to the Great Barrier Reef on day 4 and complete your course over the next 3 days. Note: Advanced Open Water, Nitrox and Rescue students will do their respective courses during this trip. Certified divers have the option of doing a live aboard trip incl. 10 recreational dives. *No dinner on day 6. Dive Course only – Prior to commencing your dive course you are required to complete a self-assessment Student Diver Medical Declaration. A positive response to any question means that there is a pre-existing condition that may affect your safety while diving and you must consult a medical practitioner preferably with experience in diving medicine to obtain a dive medical certificate that states that you are fit to undertake recreational diver training. Dive medicals and medical clearance to dive are the responsibility of the participant. Rescue Diver course commences on Sundays and finishes on Wednesdays. Gilligan’s offers all guests a free one way airport transfer from Cairns airport to the hostel between the hours of 8am to 8pm. For those wanting to take the FREE airport transfer please go to bus bay 6 outside the domestic and international terminals. A booking is required – to do this please go to https://cairnsairportshuttle.com.au/bookings/and use discount code gilarr57 to ensure you are not charged for the transfer. Maximum of 7 passengers per booking. Please remember to print or save your ticket to present to the bus driver. Timed swim (minimum 10 minutes on each dive) – underwater monitoring and species count on the Great Barrier Reef (i.e. corals, marine life species). 360-degree survey of sea bed on the dive site – Objective is to clearly identify the animals and plants observed in each section – (macro-algae, live coral, live coral rock, coral rubble and sand).